Am I crazy? My daily schedule is based on the date and time registration opens for local MABRA and MAC races. My desk calendar has the season laid out and my iPhone provides the morning reminder. For an upcoming race, I actually cancelled an important business meeting just so I could be in front of my computer, ready to pull the trigger, as soon as the registration window opened. And tell me I am not the only person who has screamed at their monitor because a slow computer is costing you valuable starting positions! Am I crazy? I have to admit that I spend countless hours each week scouring the Internet for anything and everything cross. I check the confirmed rider list on bikereg.com at least once a day to size-up the competition at my upcoming race. “Is that fast guy from last week going to be there again this weekend? Maybe he will puncture.” A name appears on the list that I don’t recognize. No worries, a quick click over to crossresults.com to get the skinny on their past performance. And all the photogs with their amazing camera work. I just click “slideshow” and let it run. If I could only get Kevin Dillard to upload his shots to demoncats.com a little sooner! Am I crazy? I created a blog chronicling my race season to share my experiences with friends and family back home in Mississippi. I post a few pictures, give a short review of each race, and, most importantly, provide details of any prizes that I won. One would think that I was receiving Academy Award type swag when I finish in the top 5 of a race. But who would not be excited about receiving my 5th place prize from Kelley Acres, a container of Rich’s Hickory Smoked Pulled Pork Bar-B-Que. I’m saving that for a special occasion. Am I crazy? If so, I am not alone. 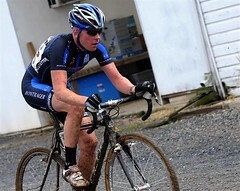 Take Steve Riskus of the All-American Cycling Team.. I am quite certain that he sleeps in his skinsuit on the eve of race day. Steve has not missed a race all season. He comes out early, sets up shop next to the race with a table of bagels and goodies free to whomever wants to indulge, races, and then settles in to watch the remainder of the day’s races usually staying through the Men’s Elite category. He is always there willing to provide assistance or advice before a race and support and cheers during. He sure has screamed words of encouragement at me on more than one occasion. He is also known to provide a good-mannered heckle or two if you make the untimely mistake over the barriers or take a spill in the mud. But what makes Steve’s situation so crazy is the fact that his lovely wife Jen is usually there right by his side enjoying the day as much as him. How many wives do you know who come out and spend the day at Cross races in the mud and cold? Steve, I have one piece of advice for you. Don’t screw it up…she is a keeper! Kris Auer. Photo by Demoncats Photography. 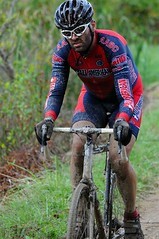 I have the great fortune to ride for arguably the best cross club in the Mid-Atlantic. 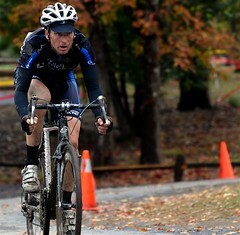 Everyone knows that Kris Auer, the undisputed leader of C3–Athletes Serving Athletes is a bit nutty over cyclocross. No one pours their heart and soul into cross like Kris. He and a band of his all-stars recently made the eight hour trek to Cincinnati to do battle in the mud for a 3-day UCI event. Three consecutive days of racing cross! I’m considering a move to Cincy. Kris is also responsible for the popular “Cobra Kai” Halloween-edition skinsuits donned by many of his racers from the C3 club based out of Joe’s Bike Shop in Mt. Washington. Are we all a little crazy for loving this beautiful sport so much? Probably. But it is the amazing collection of people who make cross what it is. They come out each week with a great attitude and wonderful perspective on both life and cycling. A helping hand, a spare wheel, or a cheer of support is always near. Kris Auer once said it best, “Always hit the line with a good attitude. You don’t need a smile on your face but be excited to race.” To not love cross? Now that would be crazy. Jay Morali is a husband and father of two little girls. He races for C3-Athletes Serving Athletes. Visit www.thequestforthepodium.blogspot.com to view his blog. Great read. My wife constantly reminds me that I’m crazy for everything you mentioned. It’s not that “you’re” crazy”, it’s that “we’re crazy”. In fact, there’s lots of us “we’s” in this craziness that it’s just normal amongst us at this point. There’s no real natural reason for cyclocross – roads need road bikes, trails need mountain bikes, hipsters need fixies – but no muddy field with steep hills and sand pits on a raw autumn day ever said “hey, I need a bike also”. CX is the most painful fun you can have racing a bike, and we do it because 40 minutes or 60 minutes of pain, suffering, hypoxic hell pan out to a week of great memories until the next week’s race, when it happens all over again. Go Ms. Riskus. My wife (Tina) is also a stalwart of the MABRA Cross Series. I get to race and she has a good time. Maybe we can get the wives to start a Cross Wives Cheer Section complete with weekly drink specials. By the way Jay, you are crazy, crazy fast. Keep up the good work. Jay you are just too cute in your biking shorts for me not to leave a reply! You are amazing keep up the good work, and don’t worry, Jen and I will “raise the girls”. Just keep on winning! !